Another workaround for those on Anniversary Edition of Windows 10, which, as a Surface owner, you should definitely get anyways. 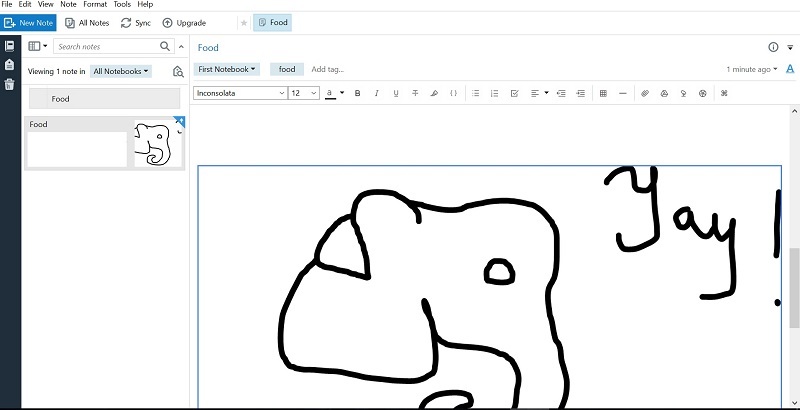 Open up Sketchpad in Windows Ink Workspace. You can edit your pen buttons so it immediately opens that screen. Draw what you want, then you can crop to the size of your drawing, and COPY it. Then you just paste into your desired note. While the previous workaround allows for further edits, this has helped me to create figures to go along with my notes. Though the previous workaround was indeed better for note-taking. I hope this helps, at least until Evernote officially supports a similar feature. please give us a pespective, how long does it take to implement handwriting-support like we discuss it. when will be released Evernote client for Windows 10 and Microsoft Sufrace Pro device? The key point is full support of hand writing by surface pen? One year ago I tested a little screen of Evernote where I can write couple notes, but that's not mature product. 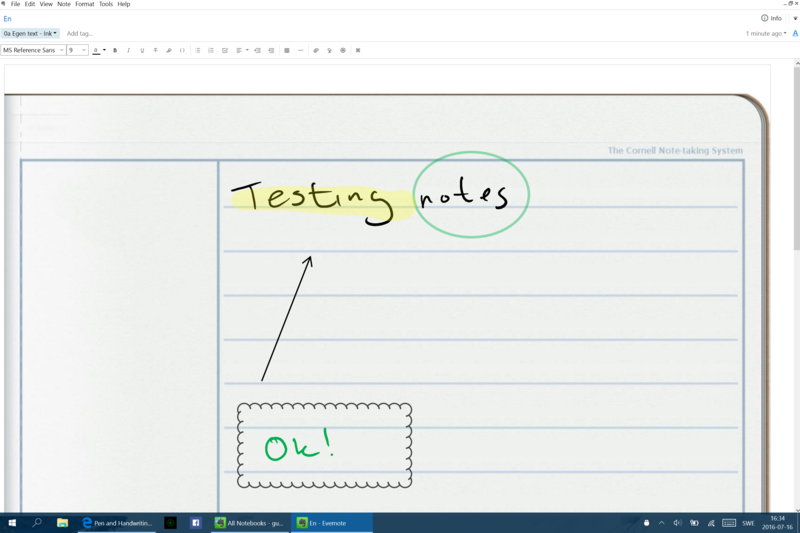 Full integration of hand writing means Evernote that can be compared to Microsoft OneNote. I have still Premium subscription of Evernote. I use it less and less since I am working with MS Surface and handwriting my notes. Evernote product does not bring real value for me without full integration of Handwriting. Agreed! Are there any plans to add handwriting support in the near future, before I port everything to OneNote? I would like to go further and request a handwriting recognition piece. Notes Plus can convert your handwriting to text. I would even be happy to pay for the new pricing model if Evernote included this feature. But as it stands I am looking elsewhere. I am up to now still searching for a way for handwriting on the Surface in Evernote. Penultimate is not a solution on the Surface. So Evernote team when can we see this feature in the touch app, web version or desktop software? I wholeheartedly agree with you now that I have the Surface Pro 4 as well. I love the computer but sadly Evernote Touch compete with OneNote2016. I've been a long-time Evernote user, but these features unleash the full potential of this computer and may cause me to switch. I hope Evernote Touch soon catches up. Yes, please integrate something. 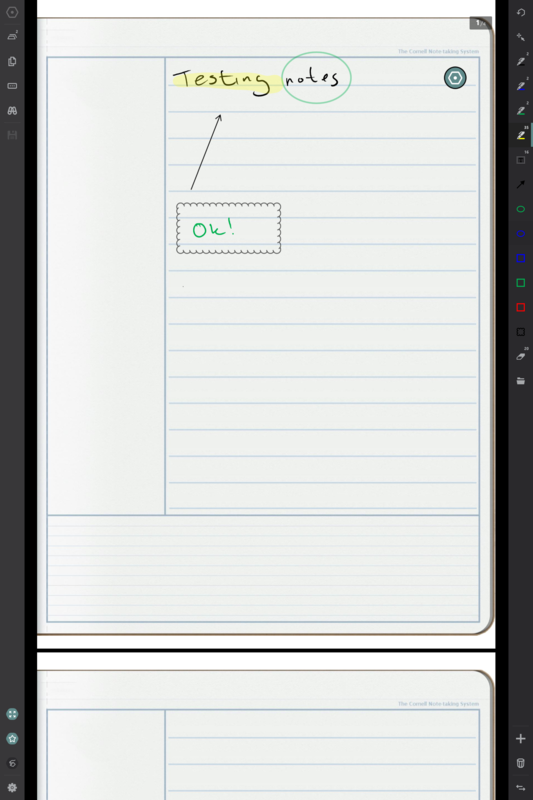 Even something to take handwritten notes in onenote and import them automatically to Evernote. I have a great workaround going, which clearly rivals OneNote (except for the unlimited drawing space in OneNote, which doesn't go well with Evernote). It involves using the Windows Store app Drawboard PDF, which actually is an awesome PDF viewer and annotation app for touch devices, with a lot of "hidden" features like instant touch access to multiple customizeable pen colors/sizes etc.. It also let's you use the eraser on the back of a Surface Pen, and like OneNote it "remembers" single operations even after you have saved the note to Evernote, so that you can still delete a seperate pen line by just one eraser touch, even several days later..
1. Open Microsoft Word and create an empty PDF with 1 or several empty pages, by using the "Export" function from the "File" menu. 2. 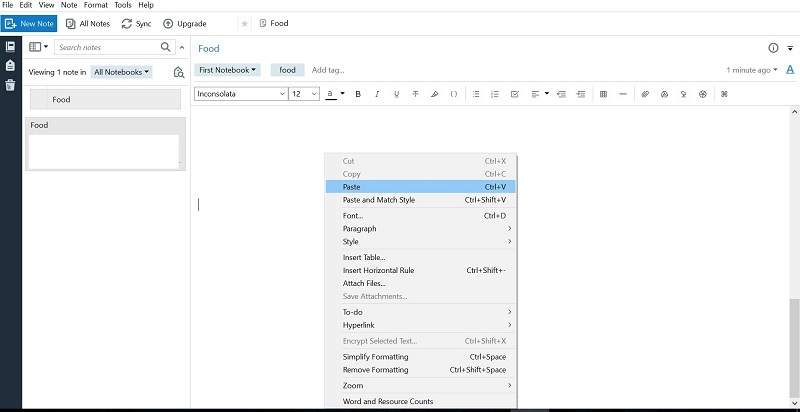 Create a new note in Evernote, and attach the PDF file so that it shows a preview of the empty document. This note will be used as a template for new handwritten notes, by having copies ready for new notes. Double click on the empty pdf in Evernote, and it will open in Drawboard PDF. After that you can just write away. To save your handwriting to Evernote, you just tap the hamburger menu and the save icon. It will immediatly show the changes in the Evernote note. After you have closed Drawboard PDF you just open the file to make additional changes by double clicking the preview in Evernote once again. Thanks for this nice workaround! i also have a Surface Pro, but for me Evernote suits my work style better. I want a note taking app that converts my handwritten notes to text. Evernote does this well, and it lets me use the pen in an intuitive way, going back to edit while still taking notes. Onenote on the other hand only allows for the pen to be used to take the notes, if I wish to return to edit, I must use a finger tap. I suppose you could say this is getting more bang for your tool, but to me it interferes with the process. (and if anyone knows how I could stop this behavior, I'd like to know it exists in all the Microsoft office products). Hey Evernote Surface Users! I am happy you all are heavy Evernote Users just like me and have the same clear desire and motivation to have Evernote Touch offering a Handwriting option. Dear Evernote Programmers. You have done such a great job on the IOS and Android environment. Please do the same for the growing Surface User Group who loves Evernote! I could have just done a +1 on this, but felt a post would be more impactful. I too bought the Surface and love it for notetaking. Am still a loyal Evernote user and have been for years, but OneNote is really calling me now .... it lacks a few things that Evernote does nicely like snagging screen caps but MSFT is enhancing OneNote quickly. 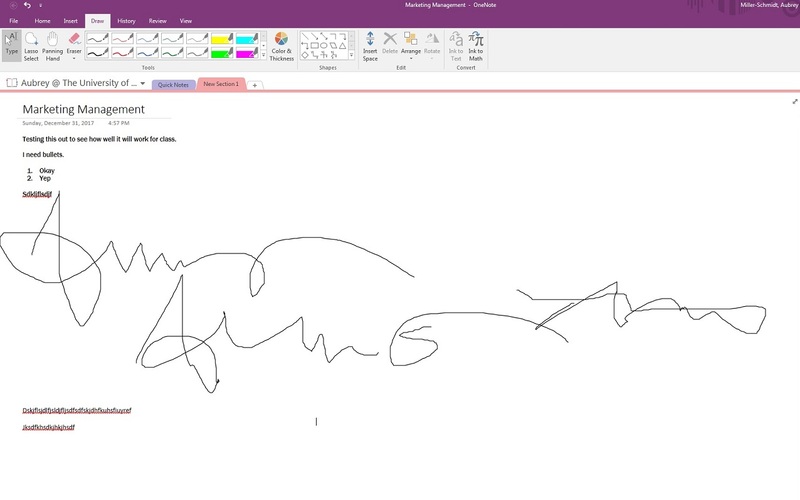 Everyone I know who has the Surface focuses on how great drawing and handwriting in OneNote is. Any feedback from the Evernote team? I'm also looking for handwriting integration into Evernote. I use handwriting in OneNote at work on a daily basis but use Evernote for organizing my personal life. I would love support for this. Love workaround idea, but need solution integrated. Any new news from Evernote on this before I begin to convert? Thanks @gustavgi This is exactly what I was looking for. I got the new Yoga Book (Windows Version) from Lenovo now in order to have a better Performance with Evernote. My biggest problem is still the lack of touch Support scrolling within notes and the Notebook & tags sidebar... Will this be fixed soon? Great idea from Metroskeptic! Works very good! Thx for sharing! Yoga book so far good for windows now if I could use inking with evernote. Touch support seems better in browser. Evernote better in android and ipad apps. perhaps could run android emulator for better app? No, that's correct. I first tried to find an app in the store that would let you open and save picture files from outside the app, as EN does OCR on picture files, but I could't find any. I tried experimenting with different x86 apps as well but everyone of those had serious pen lag except Photoshop which takes to long to load. I'm guessing when Microsoft releases Paint 3D with the Creator's update in the spring, that problem is solved. At this point, I will probably use OneNote to take notes and convert them to text that I can then cut-and-paste into Evernote so it is searchable. I don't see a better workaround yet, but Evernote could be about to surprise us users. Working with OneNote is awesome. I can scribble down thoughts using the typecover or pen - whatever feels natural. I also can snap images and move them around with my finger. I like Evernote but it's not well integreated with the Surface. Considering the Surface (and surface-alike systems) are the new "cool" Laptop you should consider adding pen support. You can do those things in Drawboard as well, with the same touch support. 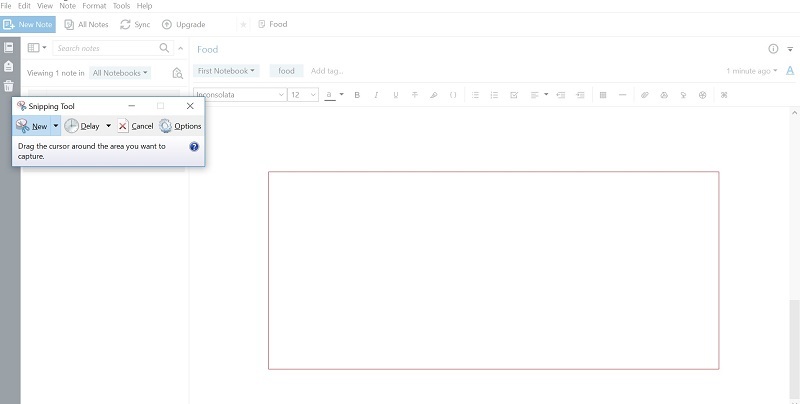 While the desktop version of OneNote has more features than Drawboard, Drawboard has a lot more features than the OneNote store app. You just have to customize the right sidebar to your liking. The lack of touch support in Evernote is a different story though. That's annoying even if you don't have a pen. Better handwriting support is really needed. The ink notes in Windows are not very good and haven't changed in quite a few years. Years! And the ability to search my handwritten notes is essential. With all the ways to put searchable content in Evernote, I would have thought handwriting would be the most sensible. Now that inking in general (and competition from OneNote) is growing, I hope Evernote will finally make this a priority. The inking system needs an overhaul, and please make all past ink notes searchable too! I am a new SP4 user and heavy Evernote user. Correct me if I am wrong: So far only InkNotes can be used, but no eraser and no scrolling. Either the workaround posted in this forum or back to OneNote 2016. Why is no on from the evernote team responding to this thread? A simple 'this not a priority' or 'we are working on it' would suffice. I am seriously thinking about switching to one note because of this. Just voicing my support for the need for Evernote to respond here and give some guidance to this discussion. The lack of response undermines any confidence a solution to the touch screen and drawing issue is even coming. I love Evernote, but today I created my first notebook in OneNote...no choice. Besides PDF Drawboard, you could use the free NEBO app (great and direct OCR of your written notes to text) and/or Microsoft's Plumbago which can export your written notes to PDF. But in the end i hope for better Windows ink support in Evernote. I don't think any of those will update the old Evernote note in real time as you write though, or let you pick up right where you left off earlier and still be able to delete old single pen strokes. They both seem to work more like Evernote/OneNote themselves, and not like an annotation tool directly integrated with Evernote. Any update on this from the Evernote team? Would love to see handwriting functionality supported for the Windows 10 Evernote app in 2017. Click on the pen (Windows Ink) next to the clock at the far right of the Windows taskbar. Pick Sketchpad. After you have drawn/written what you want in Sketchpad, you press the copy button (in between the save button and share button) and then close Sketchpad. Long press (right click) on the Evernote icon in the taskbar and pick "Paste clipboard". Done. If you have a Microsoft Surface, it's even faster if you configure the pen eraser button to open Sketchpad with just a click on the pen. This will also let you open up Sketchpad directly with that single click on the pen even if your Surface is in hibernation. I also use a MS Surface Pro, have installed Evernote for Windows and found the New Ink Note option. This actually works great! UNTIL I want to view that handwritten note in Evernote on iOS..... It doesn't show the content of my note. I'm really disappointed in this since I feel that I should be able to sync and view al my notes cross platform. I used the Livescribe pen and that worked great for handwritten notes. Please Evernote team, make sure that Ink notes are viewable on all platforms a.s.a.p. I just got a 2017 HP Spectre x360 and it comes with the HP Pen. I would LOVE to be able to use this pen with my Evernote app. Please support handwriting in a future edition. Happy to pay for it too. well, there goes evernote's chance of changing me over from onenote. without ink note support, i can't insert drawings or flow diagrams i make without it being a clunky non-editable process. As many of you, I made the move from a galaxy note to a surface. I have been utterly disappointed by the lack of proper handwritten notes on windows compared to the android version. I cancelled my premium account and moved to one note. Good bye, we once shared the same priorities! I 've been a few years of intensive Evernote users in the private and professional spheres . I work for half a year with a Surface Pro 4 and do not want to miss it . However, unfortunately, very important aspect bothers me tremendously and drove me almost to Onenote : noting the miserable ways handwritten or draw in the Windows version of Evernote . Evernote Touch offers grotesquely no (Surface ) Pen support . The iOS version has indeed integrated drawing function and Penultimate . Is something equivalent for the Windows desktop version plans or ever has in mind ? I need practical advice on how I could solve by other apps by this problem. This is already an old thread but I have to comment here because this is an issue that still - for iOS users (I have not tried other environments) - has NOT been solved. I am working on my iPad Pro using an Apple Pencil. Now who knows Apple Pencil, it has two special features, one is that the thickness of the line can be changed by applying different pressure and the other one is that if you tilt the angle and use the "sides" of the tip, it gives a stroke similar to what you'd see using a normal pencil. Now I have tried the Pencil in both Evernote and OneNote. Evernote does NOT support these features, while OneNote does. BUT, a by far worse thing in Evernote is that if you are finally able to draw sth, I recognized that I cannot make a simple "point" by touching the surface with the tip and not moving the tip. You can even very slowly move your Pencil on the surface without a line being drawn. That is just bad programming or...? Well, but I think it's an important difference here between the two. Why has a content in a blog to be approved by a moderator, espacially if it comes from a Premium Member. That sounds very much like restriction and censorship--- OMG, Evernote. Just when you are a newbie to the forum, first few posts. Has that also been experienced by other users...? Curious!! the forced touch with Pencil works, how could I miss that? however, the broad stroke /tilting the pen does not work. This feature request is in a Windows specific subforum. Please find a similar feature request in the iOS Product Feedback forum and vote it up and add your feedback there, or if you can't find one, then add a new one. I don't understand why my 5-year-old Samsung Galaxy Note (gen 1) can use handwriting recognition for Evernote, and yet the much later, much more advanced and much more expensive (Android was free version) refuses to incorporate this basic feature? I've just signed up to premium but if this doesn't get resolved at the expiry of my term I'll get another service that enables this BASIC feature for Win 10, let alone the Surface Pro, Surface Book, Surface Laptop, Surface Studio. This is ridiculous that there is no support for pen. I just stated using the Lenovo Yoga and am disappointed that I will have to switch to OneNote. I'm a Surface Pro user, and this has been bugging me for years, too. I hand write my notes in OneNote, and manually import them into Evernote. The imported notes are searchable in Evernote. The process works OK, but I'd rather just write them directly into Evernote and skip the extra steps (Import into Evernote, move the notes to the correct notebook, assign tags). Any hint from Evernote that they can add this feature? That could be the answer! Thank you! In iOS (iPhone or iPad) exist a good option. In german "Skizze hinzufügen" (in english perhaps "add sketch"?). This option would be enough for me to solve the problem. But for now, any workaround is not acceptable for a the quality of evernote. Please make this iOS-feature available in Windows! As a Sales Rep and putting all my notes into Evernote Premium version. It would be awsome to be able to write notes with the possibility to add voice recording while taking notes. Please Evernote, help us to be more productive at work. I run Windows 7 with a touchscreen monitor. 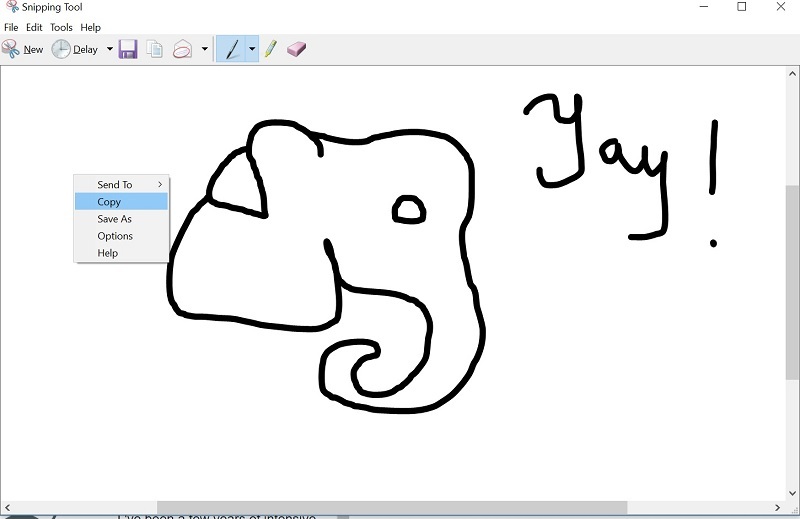 I just pulled up Evernote (Windows) assuming I could do a sketch in it... What???? I can sketch on my phone but not on my nice big monitor?? Shock an dismay! If you could make this happen yesterday, that would be great. I have used evernote for years and have heaps of data in it. I have just purchased a Surface Pro and are extremely disappointed with the evernote user experience. Lack of support for ink is surprising. Also the drag and drop "feature " in the left folder panel is very annoying. There are work around for these issues but they need to be fixed in evernote for it to be fully usable ion the surface. Is there ANY way I can do this (see attached image) in EverNote? I need the flexibility to draw and type in the same document. Please don't force me to use OneNote because of this one missing key feature! This style is my plan for taking notes next semester. How can I do this in Evernote? I need the flexibility to draw and type in the same document. I prefer to use an external editor, and include the file as an attachment to a note. That’s great. But can you edit the file again once you’ve attached it to evernote? Ok, just to clarify, say it’s a Drawpad PDF file that I’ve attached. When I open the attachment again from evernote, it will open in Drawpad. When I then make edits in Drawpad can I save and close and have the new version of the PDF automatically saved in that original evernote note? Just a +1 for this thread. Using Win 10 professional with a Wacom pad; the "ink note" works well, but as previous comentes noted you can't have handwriting and text in the same note - very limiting. Also, does anyone know why the 'annotate' feature doesn't have the same pen recognition that the ink note does? IE if you take a screen grab, paste it into a note, and then try to write something on it with your pen, it's TERRIBLE - I usually get a delay from when I click with the pen to starting the writing - this doesn't happen in other apps (OneNote, Snip, etc.) so it's definitely an evernote specific behaviour. In one of these posts someone recommended this plugin for Adobe: https://www.evermap.com/autoink.asp so instead of using Evernote's Annotate for PDFs I've been using this instead - the only downside is you don't get that nice summary slide of annotations up front. Otherwise, it's a good work around. Has anyone notice that Evernote basically gives no development updates to these forums? This has been discussed for 2 years now ugh. I was really shocked to learn that Evernote doesn't have this feature, it seems like a nobrainer. I just purchased Evernote Premium and was excited to expand my use of Evernote. However, seeing the lack of response the devs have to user request has made me rethink using it. I've begun the process of canceling my membership. Curious if any of you have done the same and what alternatives you are using with pen and tag support. Curious if any of you have done the same and what alternatives you are using with pen and tag support. I'm not a fan of Evernote's sketch feature for "pen and handwriting"
Good to hear. I just got my Boogie Board Sync tonight to use exclusively with Evernote. The Evernote handwriting has too much latency in it, which I find strange for such awesome software. I used to have a work Surface Pro and that was one thing I really liked about the OneNote that I can start typing something in a note and then mark it up or hand write something in it with the Surface Pen. When I am reviewing my notes in Evernote, sometimes I want to circle something (without the annotation tool) or hand write a note around a topic or even sketch something. I abandoned OneNote but being able to sketch/write into a note was a feature I miss for sure. I hope Evernote will be able to bring similar feature for us. I use the text highlighter tool for that (yellow color) - and insert a sketch if needed - btw, much better than OneNote, because the sketch is inserted and text below moves downwards, because EN is line-based. This is a must have feature for Surface Pro owners and probably other devices like it which are getting more popular. Why is Evernote ignoring its users and the opportunity? Curious when/if they will wake up to losing users to OneNote. Surface pro is better for drawing , I use a small Drawing Tablet without Screen XP-Pen Star G430S ( https://www.xp-pen.com/goods/show/id/302.html ) to connect to my surface pro to taking notes . the stylus is battery-free and wireless , it has 8192 pen pressure levels . it works well with Onenote Software . I've been waiting for surface pen support for some time, I've checked from time to time and always surprised that it's not in yet, it seems like a marriage in heaven. I've slowly stopped being surprised recently though, just disappointed. I'm considering a move to OneNote now for that support. 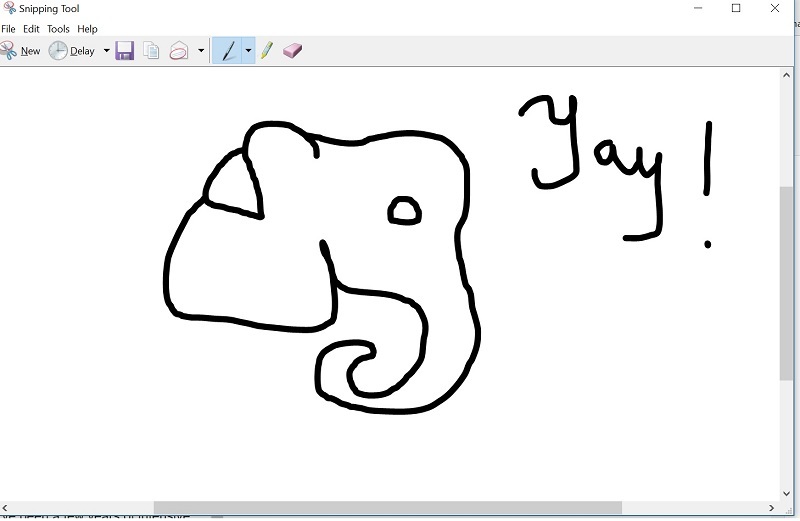 Still frustrated by how bad evernote is on a Windows surface. I find I reach for my phone to find notes rather than the larger surface. It does not seem to recognise some pen and touch events. Using the on screen mouse helps but this should not be necessary. This is a user discussion forum. There's a request posted at the top; to indicate your support, use the voting buttons at the top left corner. We just got a Boogie Board Sync, after using a Boogie Blackboard and importing enhanced photos of the screen for a year. With the Boogie Sync, I can wave to photos and import to Evernote. Is there a more direct way to import to an Evernote?